It’s no secret that the upcoming presidential election is dominating the media. From the strongly worded nightly news to the boldly printed newspaper headlines, we are constantly surrounded by the hyperbolic report of what’s to come; criticism, name calling, and aggressive drama are everywhere you turn. And odds are, your kids are hearing it too. Elections, democracy, and what it means to be president are all topics that students cover in elementary school, but it can be difficult to explain an election of this magnitude. And when you add in confusing language, mudslinging ads, and wild antics, it’s not always an easy conversation. The point of this conversation isn’t to inspire a new generations of Republicans or Democrats – it’s simply to teach students about their government by letting them see democracy in action. Whatever your political affiliation, it’s important to let your child know that you take your civic responsibility seriously – and that someday, they will have the privilege of shaping the world with their vote. There’s no need to discuss parties or to share video footage of recent debates (eh hem, I personally suggest that you skip that one); but taking the opportunity to share this monumental moment in history with your student can bring you closer, provide a great opportunity for discussion, and plant a seed for community and democratic involvement. With the overall tone of this election so far, it’s not a surprise that I struggled to find kid-friendly resources for teaching about the 2016 Presidential election. Media coverage of an election can be scary and overwhelming for a child – I was on the hunt for fun, friendly, simple resources designed just for kiddos. From books to digital games, consider using the resources listed below to open a dialogue with your child about elections, democracy, and government. These lists include fun and engaging books curated specifically for children that will allow you to broach the subject of voting and leadership in a casual way. Parentmap.org’s We Vote for These! Great Books That Get Kids Election Ready and Civics-Savvy includes not only a thorough list of resources organized by age, but also great conversation starters and activities that you can try at home to really spark your child’s curiosity. From counting bumper stickers and yard signs to discuss community involvement to letting each member of the household play President for the day, this fun article is sure to get your family talking politics in a positive way. EducationWorld offers a variety of resources in their list, Use children’s books to teach about elections: Ten books get our vote! 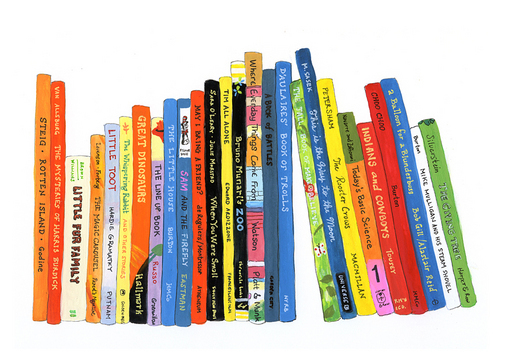 This list provides both fiction and nonfiction resources for children aged 4-12. Explore the silly side of an election with Duck for President, share the great responsibility of democracy with The Day Gogo Went to Vote, or hook your fact-obsessed nonfiction reader with Presidential Elections and Other Cool Facts. Whatever title you choose, you can’t go wrong with the titles on this carefully curated list. Targeted towards students in grades 3-5, Scholastic’s Books for Teaching about Elections includes a solid list of teacher-approved resources that are sure to get your student engaged. The heading Using These Books in the Classroom might seem intimidating, but you can find any of these books at your local library and enjoy them from the comfort of your own couch – no hall pass required! kids.usa.gov is full of resources to introduce kids to government. Educational without being overwhelming or intimidating. No matter who you vote for in November, I hope you’ll take this opportunity to share the excitement of this uniquely American process with your family. Get readin’, chattin’, and votin’, my fellow Americans! The times, they are a changin’. And I was shocked to see just how fast when I introduced a checkout system on a Chromebase computer earlier this year, which needed to be operated by a mouse. Students of all grades struggled with how to hold the mouse, click the button, hold the cursor still, and scroll to the bottom of the page. Can you believe that in the short time since touch screens and laptops have been invented, they’ve already become so mainstream that many children have never used a mouse? Our old checkout system was doing its best, but the mouse issues were causing traffic jams, frustrated students, and even more frustrated librarians and library helpers. It was easy to see… we needed help. We needed a hero! Luckily, Johnson Elementary School has a pretty incredible PTO. Give a warm welcome and a big cheer to our brand new, state-of-the-art touch screen checkout computer. With incredible accuracy and speedy internet, this baby makes checkout with all grades a breeze. Compliments keep rolling in from students, staff, and visitors alike on our beautiful new piece of equipment. And we couldn’t’ have done it without an enrichment grant from the Johnson PTO! Thanks to this generous gift from the Johnson Elementary School PTO, our library checkout is faster, easier, and more fun. This puts more smiles onto the faces of our readers and more books into the hands of our students. Thank you so much to the Johnson Elementary School PTO for providing this generous gift to our library! We are so lucky to have you. Coming Soon: Lights, Science, ACTION! Check your third and fourth grade students’ backpack this afternoon for a flyer regarding Johnson’s newest after school club, Lights, Science, ACTION! This environmental science and film-making based club is offered through the library in collaboration with local non-profit Light House Studio. Check out all the details below. I can’t wait to see what Johnson students will create! *Don’t forget to fill out both the front and the back of the permission form to enroll your student.